It’s the happiest time of the year! And the most stressful, for some. With so many holiday events, family obligations, end of year projects, and travel, the holiday season typically means indulging in a great deal of unhealthy food and drink, lack of sleep, and extreme emotion. As a result, the holidays become as much about merriment as expanding waist lines, fatigue, bloating, sugar cravings, and excess pounds. Plan Ahead: You know what events, parties, and holiday functions are coming up, and most likely, you know what kind of food will be offered. Plan accordingly. Look at the menu options and plan your order before you leave the house. Among the rich, decadent food there’s always a fruit tray or vegetable platter lurking in the shadows. Be a holiday sleuth and find clean foods wherever you plan to go. Eat Before You Start: Eat mindfully and healthfully before you head out to a big event. Make sure your meal includes plenty of veggies, lean protein, and whole grains, which will keep you satisfied and energized. When you’re hungry, you’re much more inclined to reach for high sugar, high fat options. Bring Snacks: Just because holiday decadence is all around you doesn’t mean you have to eat it. Revel in the social aspect instead of the food. Bring sliced apples, carrots, or trail mix along with your holiday gifts and snack in a way that will leave you feeling energized and lean. Indulge Mindfully: Obviously you’re not going to go through the holidays without enjoying the plethora of treats it has to offer. Healthy eating doesn’t mean you’re a holiday scrooge. Healthy living is all about balance, and part of that balance is indulgence. Just do it mindfully. Instead of eating every sample available, consciously choose what you’d like to indulge in. Are you craving that rich chocolate dessert or would a crunchy, salty treat do the trick? Start a New Tradition: Just because you’ve always prepared (or eaten) a certain dish each holiday doesn’t mean you’re obligated to do it again this year. Experiment with new recipes that provide the same sense of comfort and warmth without sacrificing health and all the hard work you’ve committed to. There are PLENTY of clean, whole food, absolutely delicious recipes that will leave you and your guests raving. Viola, a new tradition is born! Move Your Body: No succumbing to the old ‘I don’t have to time to exercise’ excuse this holiday season. Yes, you’re busy. Yes, exercise is still a priority. In fact, the reason that your days are so hectic is the very reason you should be making time to move. Sweating it off is one of the most productive ways to not only lose weight, but keep mental and emotional sanity as well. Solitary Confinement: Sometimes you just need to step away. Constant people, obligations, and parties mean little time for serenity and silence. Carve out time in your insanely busy schedule to be alone, even if that means hiding in the closet for 5 minutes to breath and calm your mind. Deep Breathing: There’s a lot going on, and you don’t want to miss a single moment of it. That’s great; just don’t forget to breathe. Deep breathing keeps you grounded, focused on the present moment, and better able to handle all the needs and demands of the holiday season without succumbing to stress and reaching for weight sabotaging food. Make this a monumental holiday season. This year, let’s not give yourself permission to eat stuff you wouldn’t normally bring home from the store just because it’s the holidays. This time of year is filled with temptation that can sabotage your health, wellness, and weight loss goals. But they don’t have to. You are 100% in control of the foods that go into your mouth. The choices you make now impact the status of your body, your health, and your family, so honor the new lifestyle you’ve created and love yourself up! Categories: Health and Wellness, Inspiration and Motivation, Nutrition, Nutrition Program(s), Preventative Health | Tags: Eat Clean Health, healthy eating during the holidays, holiday weight gain, how to beat holiday pounds, how to lose weight during the holidays, jodi geigle | Permalink. You work hard to lose weight. You pay attention to what you eat and how intensely you exercise, but when it comes to staying hydrated, it’s possible that you’re unintentionally sabotaging your best efforts. If your body seems to have hit a plateau, try drinking more water to get things moving! Improves Energy Levels: It’s hard to work out when your energy is lagging. Proper hydration increases energy levels and gets your b lood flowing. Water is best, but green tea and coconut water are also great sources of hydration and fuel. Halts Hunger: People often mistake thirst for hunger. If your energy is starting to lag, drink 1-2 glasses of water before eating a snack. If you’re still hungry after 10-15 minutes, reach for a healthy snack, but you’ll probably find that water was all your body needed. Improves Metabolic Rate: When you’re well hydrated, your metabolism runs at top speed, so you burn calories faster than normal. Boost your daily fat burn by continuously supplying your body with water, leading to a healthier, trimmer you. Flushes Toxins: Our bodies absorb a lot of toxins, not just from the food we eat, but environmental and cosmetics pollutants as well. These toxins cause digestive and hormonal imbalances, which in turn leads to weight gain and trouble losing weight. Drinking plenty of water throughout the day encourages the body and it’s various hormonal, metabolic, digestive systems to function normally. Categories: Health and Wellness, Nutrition, Nutrition Program(s), Preventative Health | Tags: Eat Clean Health, healthy benefits of water, importance of water drinking, jodi geigle, proper hydration tips, strong metabolism | Permalink. Most Americans are deficient in Vitamin D, yet more and more studies are revealing its vital importance. 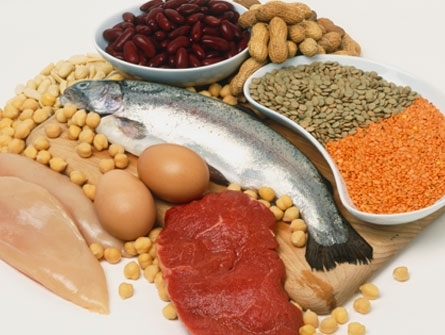 This amazing vitamin helps prevent osteoporosis, depression, cancer, diabetes, obesity and more. Vitamin D prevents osteoporosis, depression, prostate cancer and breast cancer, and may prevent or delay the onset of diabetes and obesity. Vitamin D is perhaps the single most underrated nutrient in the world of nutrition. That’s probably because it’s free; your body makes it when sunlight touches your skin, and all you need is 5-10 min. of direct sunlight per day to encourage healthy production in your body. When combined with a clean eating approach to nutrition and lifestyle, more and more studies are showing that vitamin D supplementation helps to promote increased weight loss among those whose levels are low to begin with. If you suspect you may be low in Vitamin D, supplementation and direct sunlight may benefit your weight loss efforts. And of course, food also plays an important role! Categories: Health and Wellness, Nutrition, Nutrition Program(s), Preventative Health, Vitamin(s) | Tags: clean eating, food sources of vitamin d, Vitamin D, vitamin d and weight loss | Permalink. As a tasty follow up to last week’s post on the Top 20 Healthy Cooking Substitutions, this week is all about putting it into practice. This recipe has been tested in the Eat Clean Health Kitchen and the results were a resounding ‘Yum!’. So if you’re the mood for a sweet treat without the refined flour or refined sugar, give this one a go! Directions: Preheat oven to 350 degrees Fahrenheit. Place the beans, chocolate chips, coconut oil and eggs in a food processor; cover and blend until smooth. Add the coconut sugar, cocoa, vanilla, baking powder and salt; blend until smooth. Transfer to a 9-inch square baking pan coated lightly with coconut oil to keep brownies from sticking. Bake for 25 to 30 minutes or until a toothpick inserted near the center comes out clean. Cool on a wire rack. Cut into bars. Keep refrigerated to help brownies hold their shape. These deliciously clean black bean brownies are not only unbelievably gooey and indulgent, they’re also gluten free. At approximately 175 calories per serving, you can indulge mindfully (these are still brownies, after all) and go about the rest of your active, healthy day. If you have any favorite clean eating, clean baking, clean cooking recipes, please feel free to share. And for personalized support and information related to clean eating, balanced nutrition, and healthy lifestyle, visit Eat Clean Health and look at the variety of nutrition plans, programs, detoxes and meal plans found there. And don’t forget to sign up for the Eat Clean Health monthly newsletter. 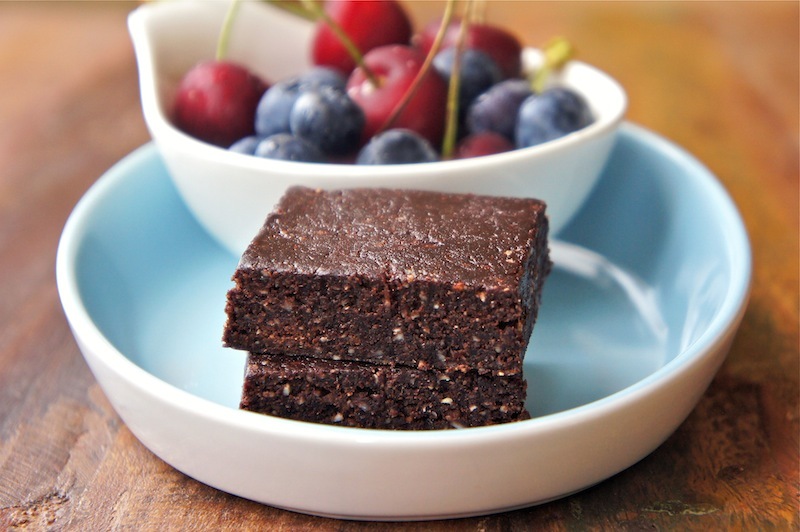 Categories: Dessert, Nutrition, Nutrition Program(s), Recipe(s), Snacks | Tags: black bean brownie recipe, black bean brownies, clean eating, clean eating dessert, clean eating ideas, clean eating recipes, clean eating snack recipes, clean eating substitutions, clean eating sweet snacks, cooking with coconut oil, dairy free brownies, eat clean, Eat Clean Health, gluten free, gluten free dessert, healthy baking substitutions, healthy brownie recipe, healthy chocolate, healthy cooking substitutions, healthy dessert | Permalink. We all crave something a little sweet from time-to-time. When it comes to satisfying your sweet tooth and keeping your health goals on-track, what matters most is the QUALITY and type of sweet treat you reach for. Enter the almighty date! Dates are a nutritional powerhouse of vitamins, minerals and phytonutrients. Just one date offers 2 grams fiber, which helps stabilize blood sugar and helps move waste through the body. Vitamins A and K found in these tiny nuggets promote healthy skin, lungs and eyes, while the high content of minerals such as copper and magnesium help prevent oxidative stress, which helps prevent heart disease and certain cancers while boosting immune function in the body. To get started, try these homemade Energizing Chocolate-Date Bars, copied from Angie Tee at Sea Salt with Food, which can help you push through a grueling workout. Or try the ultra-satisfying Stuffed Date for a decadent, delicious treat. Combine chopped dates, cashews, almonds, cocoa powder, and sea salt in a food processor. Pulse and process all the ingredients together until the texture is coarse. Then add the shredded coconut, a quick pulse, and add the vanilla extract, a little water at a time until it reaches a dry but moist dough consistency. Scrape the dough mixture into the lined pan, press evenly with a rubber spatula, and chill for about an hour before serving. Cut a date in half and remove the seed, and then stuff with 1 tablespoon of almond butter or Sunbutter. Sprinkle with cinnamon & raw honey for a sweet treat, or leave the honey off and enjoy the delicious richness of the date paired with your chosen nut or seed butter. For individual support and information related to clean eating, balanced nutrition, and healthy lifestyle, visit Eat Clean Health and don’t forget to sign up for the Eat Clean Health monthly newsletter. Categories: Breakfast, Dessert, Health and Wellness, Nutrition, Nutrition Program(s), Preventative Health, Recipe(s), Snacks, Vitamin(s) | Permalink. Experimenting with spices is one of the most delicious and healthy ways to flavor your food and expand your expertise in the kitchen. Whether you’re an herb novice or a spice aficionado, these 7 spices to slim down and boost health provide an array of taste, body-boosting pizazz and culinary excellence! Give you brain an extra boost with Cumin. Lab studies indicate that cumin’s anti-inflammatory properties can improve memory as well as lower stress. Add some to your homemade hummus sprinkle it over pumpkin seeds before roasting. This nutty-tasting spice is packed with fiber, helping people fill fuller and eat less. If you want to experiment, try sprinkling some into your morning smoothie or over your veggie sauté. It can also add a nice flavor to roasted meats or veggies. Ginger is a natural anti-inflammatory, which helps reduce muscle pain. After an especially intense workout, add fresh ginger to your smoothie or vegetable sauté. Ginger has also long been touted as an excellent remedy for nausea as well as………..
You’ve probably heard that a dash of cinnamon can help balance blood sugar (which is true), but did you know that cinnamon also support strong bones? The manganese found in cinnamon helps bones stay healthy and strong, so try sprinkling some in your smoothie, lemon water or morning fruit bowl to support a sturdy frame. The capsaicin found I n red peppers and chilies helps boot your metabolism, encouraging the body to burn fat. Studies have also shown that people who add heat to their food have a tendency to eat less, helping maintain a healthy body weight. Add to veggies, soups and meats. 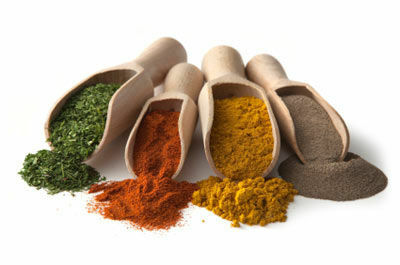 My favorite of all spices, turmeric helps alleviate arthritis and lower cholesterol. Its high concentration of antioxidants and anti-inflammatory properties also improves mental health as well as lowers the risk of certain cancers. Plus, it’s delicious added to almost anything. Sprinkle in eggs, smoothies, soups, veggies, grains and meat. Delicious! 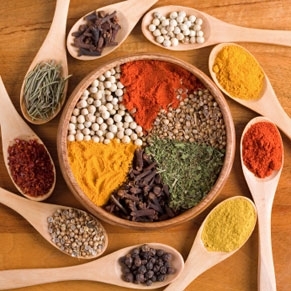 Categories: Health and Wellness, herbs and spices, Nutrition, Nutrition Program(s), Preventative Health, Vitamin(s) | Tags: Anti-inflammatory, boost immunity, cajun, Cinnamon, cumin, Eat Clean Health, fat loss, fenugreek, Ginger, health benefits of herbs, herbs, herbs and spices, mental focus, metabolsim, spices, turmeric | Permalink. 70% of illness in the United States is diet related. That is a staggering statistic. Over 100 million are chronically ill. 70 million of them don’t have to be. Improving the foods you eat is the NUMBER ONE way to prevent chronic illness and protect yourself from illness and disease. One of the leading causes of chronic illness is chronic stress. You already know that you can eat your way to a healthier body, clear skin and increased energy, but did you know that you can also eat your way to less stress, helping stave of chronic illness and disease? The B vitamins found in avocados are essential for healthy nerves and brain cells. Constant anxiety and high stress is linked to vitamin B deficiency, so try adding avocado to your morning smoothie or daily salad. As an added bonus, avocados are also high in body-healthy monounsaturated fats and potassium, which can help lower high blood pressure. When you’re feeling blue or hyper-stressed, reach for the berries! Blueberries in particular are loaded with Vitamin C and antioxidants, which help repair and protect the body’s cells, leading to a calmer, healthier, more balanced you. Add blueberries to oatmeal or smoothies to add fiber-rich sweetness to your meal, or eat them alone for a tasty snack or healthy dessert. In addition to the crunch factor, which in-and-of itself can be a great stress reliever, almonds are a great source of vitamins B2 and E, which support a strong immune system and promote energy balance in the body. Almonds are great as a snack or added to salads, and if you’d like something creamy, try 1-2 tablespoons of almond butter. Always opt for the natural version, though; you want to avoid added sugars and oils. The ingredient list should say almonds and perhaps a little salt. That is all. Nothing else is needed. Vitamin C is kind of the superhero of nutrients. In addition to boosting the immune system and promoting healthy skin, it also lowers blood pressure AND reduces the stress hormone cortisol, leading to a leaner, stress-free you. Start the day with warm lemon water or grab a fresh orange as a snack. 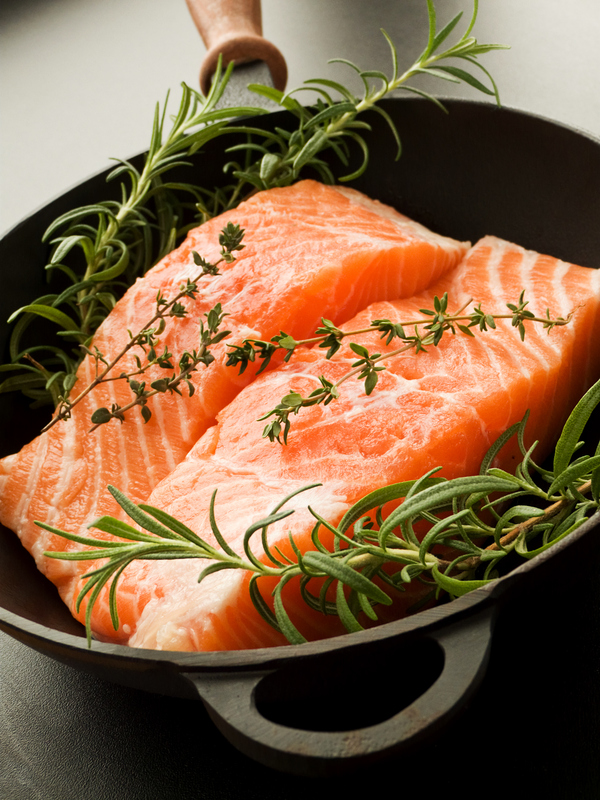 One of the best sources of omega 3 fatty acids is wild-caught salmon, which helps keep cortisol and adrenaline from sky rocketing when you’re feeling tense. The healthy fatty acids also protect your heart and nourish your skin, helping you stay healthy and glowing from the inside-out. Aim for a 4 ounce serving of wild-caught salmon approximately 2-3 times a week. If fish isn’t your thing, walnuts can also be a great source of omega 3’s. 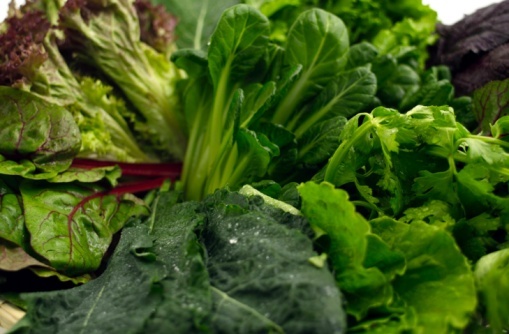 Leafy greens are loaded with magnesium, which is a mineral that helps regulate cortisol, the stress hormone. Eating greens on a daily basis encourages feelings of well-being and balance, plus support overall health. It is important, however, to ROTATE YOUR GREENS. Too much of a good thing can cause imbalances in the body, so experiment with different types on a regular basis. Add greens to an omelet or smoothie, create a mixed green salad, or saute in coconut oil for a delicious dinner. If chronic stress is part of part of your daily life, it’s time to get active and get serious about taking steps to remove it. Stress leads to all kinds of internal and external health problems, so the next time you feel the tension in your neck or the anxiety in your chest, take a deep breath, exhale slowly and reach for one of the foods listed above. For extra stress support, dietary changes and healthy living tools, please contact Jodi. Categories: Health and Wellness, Holistic Health, Nutrition, Nutrition Program(s), Preventative Health, Snacks | Tags: antioidants, blueberries, chronic illness, clean eating, fiber, holistic health, increased energy, stress relief, strong immune system, Vitamin C, wild-caught salmon | Permalink.